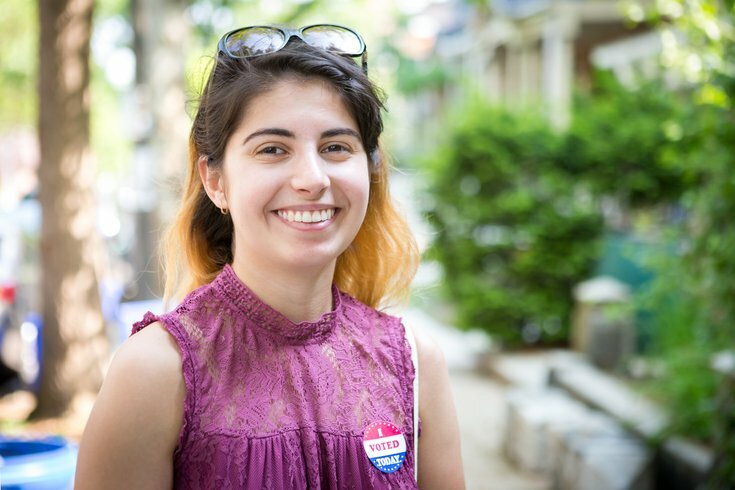 West Philadelphia resident Johana Barxha voted Tuesday morning at the Spruce Hill Community Association, less than 10 hours after returning from months of being out of the country. It's primary day in Pennsylvania and polls are open until 8 p.m. Voters will find a number of races that are wide open – especially in congressional districts that look much different. That's because they were redrawn by the Pennsylvania Supreme Court earlier this year to eliminate the heavily gerrymandered map approved by state legislators in 2012 and challenged in court last year. Moreover, a number of congressional incumbents in the Philadelphia area have bowed out, including Democrat Bob Brady, the subject of an FBI corruption trial who is not seeking election, and Republican Ryan Costello, who retired ahead of a re-election battle in his new, more equitably drawn district. The vacancies have spurred crowded fields in a few districts as candidates try to take advantage of the upheaval. After the polls close on this Pennsylvania primary, we'll know which Republicans will challenge incumbent U.S. Sen. Bob Casey and incumbent Governor Tom Wolf in November. And who will be on the ballot in November to help Democrats in their efforts to gain control of the U.S. House. Bob Casey is seeking his third term in the U.S. Senate. The Scranton native is unopposed on the Democratic ballot, but there is a Republican contest to see who will challenge him in November. U.S. Rep. Lou Barletta, the leading contender, and state Rep. Jim Christiana of Beaver County are seeking the party nomination. The Philadelphia District Attorney’s Office’s Election Fraud Task Force is ready to respond to any issues voters may have. Call the hotline at 215–686–9641, 9643 and 9644. In Philadelphia, voters can report issues or problems encountered at the polling place to the County Board of Elections at 215-686-1590. Barletta is supported by President Donald Trump and the state GOP. On the campaign trail, he has criticized Casey's support for Obamacare and sanctuary cities and his opposition to the GOP tax cut. Christiana is telling voters that Barletta isn't all that different than Casey on fiscal issues, criticizing his opponent for supporting the recent $1.3 trillion government spending bill. Libertarian Dale Kerns is also on the ballot. Pennsylvania is seen as a vital cog in the Democrats' effort to retake the U.S. House. The new congressional voting districts look to provide a number of chances to flip some congressional seats in the mid-term elections in November. Here's a look at the congressional primary races in the Philadelphia area. 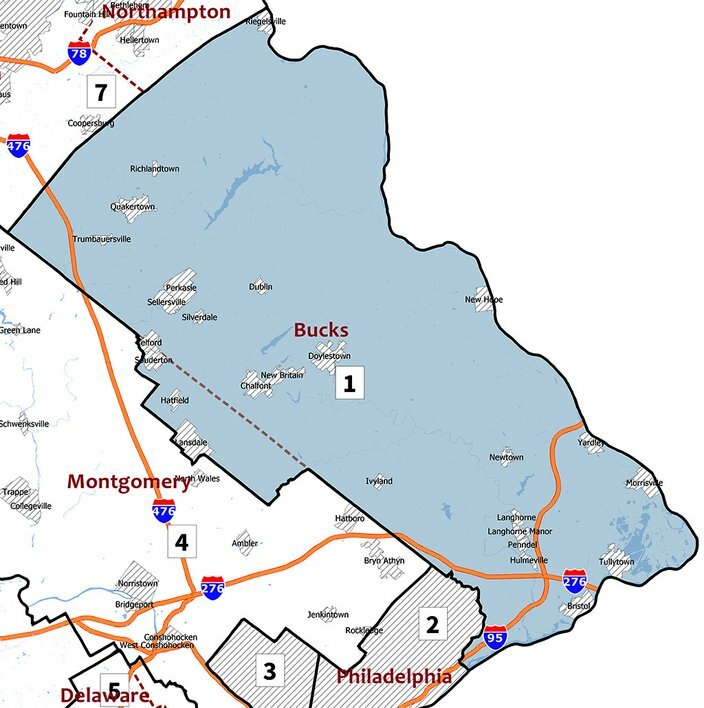 The redrawn First Congressional District encompasses Bucks County and a small part of Montgomery County, including Lansdale and Hatfield. Republican incumbent U.S. Rep. Brian Fitzpatrick is challenged by Dean Malik in the new First Congressional District that includes all of Bucks County and a small piece of Montgomery County that includes Hatfield and Lansdale. Fitzpatrick, a former Special Assistant U.S. Attorney and FBI supervisory special agent in California, won the seat in 2016, taking it over from his brother, Mike, who retired after four terms. Malik is an attorney and former Bucks County prosecutor, civil litigator and veteran of the Marine Corps. Seeking the Democratic nomination are three candidates: Steve Bacher, who worked for 30 years in the higher education, nonprofit and government sectors; Rachel Reddick, a mother who formerly prosecuted sexual assault cases in the U.S. Navy; and Scott Wallace, a former counsel to the U.S. Senate Judiciary Committee and the U.S. Senate Committee on Veterans Affairs who runs a charitable foundation. The redrawn Second Congressional District encompasses Northeast Philadelphia, the River Wards and parts of North Philadelphia. Incumbent U.S. Rep. Brendan Boyle, a Democrat from Northeast Philadelphia, is seeking his third term in the new Second Congressional District, which encompasses Northeast Philadelphia, the river wards and parts of North Philadelphia that lie east of Broad Street. Boyle faces a challenge from Michele Lawrence, an entrepreneur and CEO of MicheleSpeaks LLC, a self-empowerment business, and former longtime banking industry executive. Running unopposed for the Republican nomination is David Torres, a West Kensington retiree and political newcomer. The redrawn Third Congressional District encompasses West Philadelphia, Northwest Philadelphia and Center City. Incumbent Dwight Evans, a Democrat, is seeking his second term in the 3rd Congressional District, which now includes parts of Center City, West Philadelphia and Northwest Philadelphia. He is challenged by Kevin Johnson, a public education advocate and president and CEO of Philadelphia OIC, the workforce development organization founded by the late Rev. Dr. Leon Sullivan to eliminate poverty, unemployment and illiteracy. Republican Bryan Leib, a Center City resident, is unopposed. The redrawn Fourth Congressional District encompasses most of Montgomery County and a small part of Berks County, including Boyertown. 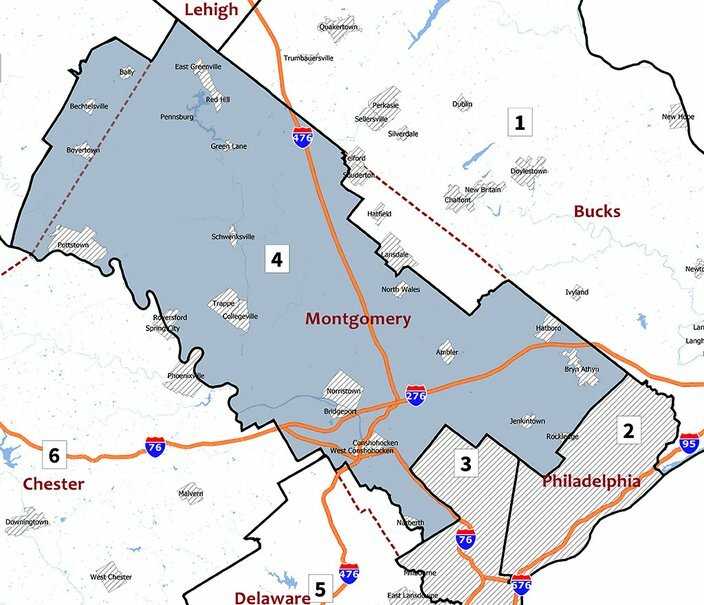 It's an open field in the 4th Congressional District, which now includes all of Montgomery County (except for a small sliver in Lansdale/Hatfield and a part of the Main Line) and a small part of eastern Berks County. Three Democrats with name recognition are seeking the nomination: state Rep. Madeleine Dean, who co-founded the gun violence prevention caucus, PA SAFE; gun control activist Shira Goodman, CEO of CeaseFire PA; and Joe Hoeffel, a congressman from 1999 to 2005, and former Montgomery County commissioner and state representative. On the Republican side, Dan David is seeking the nomination. He is a business executive and entrepreneur, and co-founder of GeoInvesting, an equities markets research firm. The redrawn Fifth Congressional District encompasses Delaware County, South Philadelphia, Southwest Philadelphia and part of Montgomery County, including Bryn Mawr, Villanova and Ardmore. 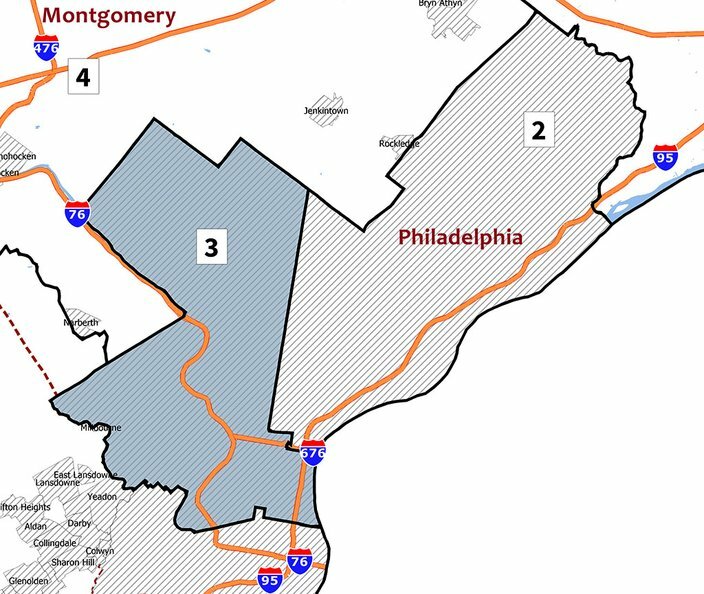 It's a free-for-all in the 5th Congressional District, where 10 Democrats are seeking the nomination in a reconfigured district that includes all of Delaware County and parts of South Philadelphia and Southwest Philadelphia. The field comprises Larry Arata, a former software salesman and public school teacher who founded the Opioid Crisis Action Network; state Rep. Margo Davidson; Thaddeus Kirkland, mayor of Chester; Richard Lazer, a long-time activist and former deputy mayor for labor for Philadelphia Mayor Jim Kenney; Lindy Li, a cancer research advocate and founder of an education company; Ashley Lunkenheimer, a former federal prosecutor and health care advocate; Mary Gay Scanlon, a child advocate, former attorney for the Education Law Center of Pennsylvania and national pro bono counsel at the Ballard Spahr law firm; Molly Sheehan, a recognized cancer researcher; state Rep. Greg Vitali; and Theresa Wright, founder of a record management business and the Dare to Compare program. Republican Pearl Kim, a special victims prosecutor, is unopposed. 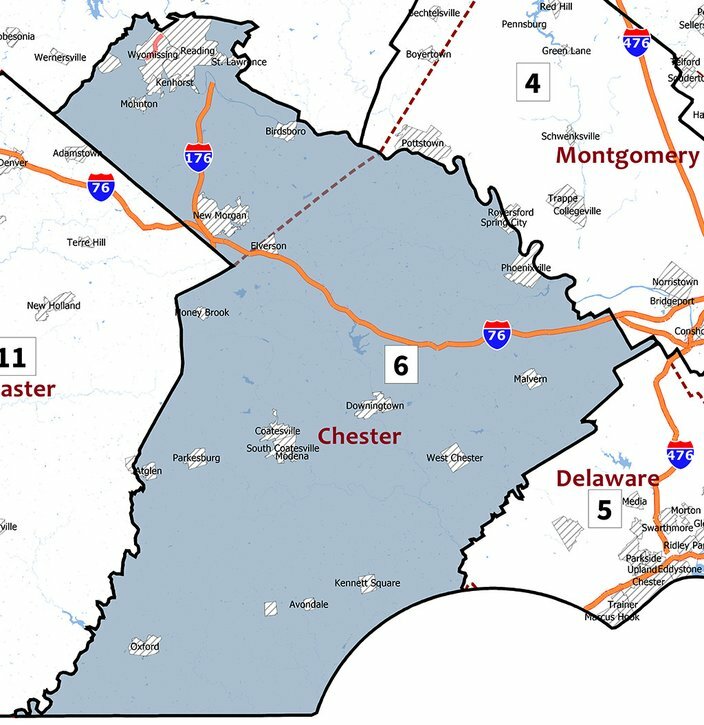 The redrawn Sixth Congressional District encompasses Chester County and part of Berks County, including Reading. It's an uncontested primary in the redrawn 6th Congressional District, which now includes all of Chester County and a portion of Berks County, including the city of Reading. Republican incumbent U.S. Rep. Ryan Costello withdrew from the race after the new districts were announced. On the Republican side is Greg McCauley, a businessman who operated Wendy's restaurants with his family and was on the Quigley Corp. team that made Cold-EEZE a national-brand. Democrat Chrissy Houlahan, a U.S. Air Force Reserve captain and former chief operating officer of the AND1 Basketball apparel and footwear brand, is unopposed as well. Which Republican will challenge incumbent Gov. Tom Wolf in November? Three will vie for the GOP nomination: state Sen. Scott Wagner from York County, the frontrunner according to a recent poll; Laura Ellsworth, a Pittsburgh attorney; and Paul Mango, a U.S. Army veteran from Pittsburgh who works for a business leadership and professional advisory firm. Wolf, who is seeking his second term, is unopposed. Libertarian Ken Krawchuk of Abington, Montgomery County, founder of a 25-year-old information technology consulting firm and a computer programmer, is also on the ballot. A full slate of Democrats and Republicans is running for lieutenant governor. On the Democratic side, incumbent Mike Stack, of Philadelphia, is challenged by Nina Ahmad, a scientist and former president of the Philadelphia National Organization for Women (NOW); Chester County Commissioner Kathi Cozzone; John Fetterman, mayor of Braddock, Pa.; and Ray Sosa, president of Round Hills Investments and Services, a career banker and insurance agent from Montgomery County. On the Republican ballot are Jeff Bartos of Philadelphia, who owns a contracting company and several real estate companies in the Philadelphia area; Kathleen Coder, an Allegheny County businesswoman and community leader seeking to reform Pennsylvania politics; Peg Luksik, a longtime educator and anti-abortion advocate from Johnstown; and Diana Irey Vaughan, a Washington County commissioner. In the 26th Senatorial District, which includes parts of Chester and Delaware counties, Democrats Tanner Rouse and Timothy Kearney are seeking the nomination to challenge incumbent Republican Thomas McGarrigle, who is unopposed. Rouse is a former Philadelphia assistant district attorney; Kearney is mayor of Swarthmore Borough. There are a number of primary contests for local seats in the Pennsylvania House of Representatives. In the 53rd Legislative District, which includes parts of Montgomery County, Democrats Steven Malagari and Leon Angelichio, both Lansdale Borough councilmen, are running for the party nomination to challenge incumbent Republican Tim Hennessey in the November general election. In the 74th Legislative District, which includes parts of Chester County, Democrats Dan Williams, Frank Pryor and Joshua Maxwell are seeking the party nod to run against incumbent Republican Harry Lewis. Williams is senior pastor of The New Life in Christ Fellowship; Pryor is a political science professor at Villanova University; and Joshua Maxwell is mayor of Downingtown, Chester County. In the 143rd Legislative District, which includes parts of upper and central Bucks County, college educator Wendy Ullman and Doylestown Borough Councilman Timothy Brennan are running for the Democratic nomination to challenge incumbent Republican Marguerite Quinn. In the 155th Legislative District, which includes parts of Chester County, Ronald Graham and Danielle Friel Otten are seeking the seeking the Democratic nomination to challenge incumbent Republican Becky Corbin. Graham is supervisors chairman in East Pikeland Township and Otten is a marketing professional. In the 158th Legislative District, which includes parts of Chester County, Republican incumbent Eric Roe is challenged by William Westbrook Jr. In the 160th Legislative District, which includes parts of Chester and Delaware counties, Democrats Catherine Spahr and Anton Andrew are running for the party nomination to challenge incumbent Republican Stephen Barrar. Spahr is codes, planning and zoning administrative coordinator and assistant zoning officer for Newtown Township; Andrew is a Kennett Township attorney. In the 165th Legislative District, which includes parts of Delaware County, Republican incumbent Alexander Charlton is facing a challenge from Regina Scheerer. In the 167th Legislative District, which includes parts of Chester County, Democrats Jeffrey McFall and Kristine Howard are facing off for the right to challenge incumbent Republican Duane Milne. McFall is a digital marketing professional from East Whiteland, while Howard is a political activist and was a child advocate for children in foster care in Philadelphia. In the 168th Legislative District, which includes parts of Delaware County, Kristin Seale and Philip Block are seeking the Democratic nomination to challenge incumbent Republican Christopher Quinn. Seale works for an energy non-profit and sits on the Rose Tree Media School Board and Block is a scientist and a technology director of water treatment for a Philadelphia–based chemical company. In the 175th Legislative District, which includes parts of Philadelphia, Democratic incumbent Michael O'Brien is challenged by Deborah Derricks, the director of development for The Veterans Multi-Service Center in Philadelphia. In the 177th Legislative District, which includes parts of Philadelphia, the race to fill the seat of retiring, longtime Republican incumbent John Taylor has drawn a field of Democratic candidates: Margaret Borski, Joseph Hohenstein, Sean Kilkenny and Daniel Martino. Republican Patty Pat Kozlowski is unopposed. Borski is the daughter of former congressman Bob Borski; Hohenstein is an immigration attorney and small business owner; Kilkenny is a plasterer and youth basketball coach; and Martino is a board member for the Olde Richmond Civic Association. In the 179th Legislative District, which includes parts of Philadelphia, Democratic incumbent Jason Dawkins is facing a challenge from Abu Edwards, co-founder of the Millennials in Action PAC and former president of Friends of Greater Olney Library. In the 184th Legislative District, which includes parts of Philadelphia, longtime incumbent Democrat William Keller is not seeking reelection. Seeking the Democratic nomination are Tom Wyatt, Nicholas DiDonato Jr., Elizabeth Fiedler and Jonathan Rowan. Wyatt is an attorney representing townships and cities around Pennsylvania; DiDonato is a retired Philadelphia detective; Fiedler is a former WHYY reporter; and Rowan has served for 20 years in the district offices of two state senators. In the 188th Legislative District, which includes parts of Philadelphia, longtime Democratic incumbent James Roebuck is challenged by Jeffrey Curry, a lawyer whose spent most of his career in the City of Philadelphia Law Department, and Diane Settles, a 10-year executive assistant at Children’s Hospital of Philadelphia. In the 190th Legislative District, which includes parts of Philadelphia, Democratic incumbent Vanessa Brown is challenged by Wanda Logan, who worked in employment recruiting and staffing, and Raymond Bailey Sr., who ran unsuccessfully for a seat in the 194th Legislative District in 2012. In the 197th Legislative District, which includes parts of Philadelphia, Democratic incumbent Emilio Vazquez is challenged by Frederick Ramirez, executive director of Pan American Mental Health Services, and former City Council aide Danilo Burgos. In the 198th Legislative District, which includes parts of Philadelphia, Democratic incumbent Rosita Youngblood is challenged by Bernard Williams, a former chief operating officer of the Making Our Lives Easier community organization who does finance in the healthcare sector. In the 200th House District, which includes parts of Philadelphia, Democratic incumbent Christopher Rabb is challenged by Melissa Scott, former senior IT project manager for the City of Philadelphia’s Revenue Department and a community activist. The first asks voters if the city charter should be amended to appropriate $500,000 (or more, if city council desires) annually to the city's Police Advisory Commission. Ballot Question: Shall The Philadelphia Home Rule Charter be amended to require an appropriation in each annual operating budget of $500,000, or such greater amount as Council decides, to the Police Advisory Commission or any successor body or bodies? The second question asks voters, in part, if the city charter should be amended to restore local control by confirming the Board of Education's administration of Philadelphia public schools. Ballot Question: Shall the Educational Supplement to the Philadelphia Home Rule Charter be amended to restore local control by confirming the Board of Education’s independent responsibility to administer the School District of Philadelphia, providing for public participation in the Educational Nominating Panel process, revising eligibility requirements, requiring City Council confirmation of School Board appointments, requiring a stated reason for removing a School Board Member and establishing a Parent and Community Advisory Council? Statement: The School District of Philadelphia is currently governed by the School Reform Commission, a State-created and State-controlled entity. On July 1, 2018, the School Reform Commission will cease to exist, and governance of the District will return to the Board of Education, a City-created and City-controlled entity. The Home Rule Charter currently provides that the Mayor appoints the members of the Board of Education. The third question asks voters if the city charter should be amended to mandate workplace sexual harassment training for all city officers and employees. Ballot Question: Shall the Philadelphia Home Rule Charter be amended to provide for mandatory training for all City officers and employees regarding sexual harassment in the workplace? Statement: Currently, no law in Philadelphia requires mandatory training for all officers and employees of the City regarding sexual harassment in the workplace. This proposed amendment to the Home Rule Charter would require that the City’s Administrative Board (the Mayor, Managing Director and Director of Finance) make rules requiring that all City officers and employees receive such training not less than once every three years. Polls in Pennsylvania are open from 7 a.m. to 8 p.m. on Tuesday. Anybody in line by 8 p.m. must be allowed to vote. You are not required to show photo ID to vote in Pennsylvania if you are voting at a poll where you have voted previously. In fact, poll workers are not permitted to ask about it. If you are a first-time voter or voting at a new poll location for the first time, then you are required to show either photo or non-photo identification. The Voter ID law as it pertains to absentee voting was not challenged legally and remains in effect. You may need an umbrella if you are voting after work. According to the National Weather Service, there's a chance of showers and thunderstorms after 4 p.m. Partly sunny, with a high near 90, and more humid. Southwest wind 5 to 13 mph. Chance of precipitation is 30 percent. The Philadelphia District Attorney's Office Election Fraud Task Force is ready to respond to any issues voters may have. Call the hotline at 215–686–9641, 9643 and 9644.